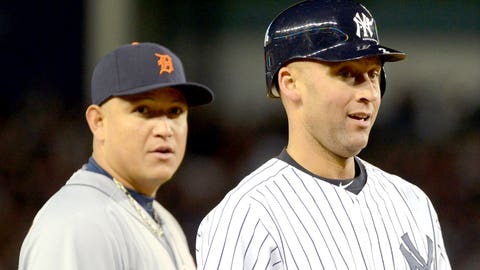 Miguel Cabrera certainly doesn't trail Derek Jeter when it comes to on-field earnings. Derek Jeter is retiring after this season, and we’ve spent a lot of time debating who the next Face of Baseball will be. After Thursday, I nominate Miguel Cabrera — even if the distinction will have a different meaning with him than it has for Jeter. Cabrera has agreed to an eight-year, $248 million contract extension with the Detroit Tigers, sources told FOX Sports. The $31 million average base salary for the new deal is believed to be the largest in team sports. As in, any athlete, anywhere. More than Aaron Rodgers, more than LeBron James, more than Sidney Crosby, more than Wayne Rooney, more than Lionel Messi. Cabrera’s new contract is symbolic and significant on a number of levels. First, there is the basic narrative: A hitting genius born to working-class parents in Maracay, Venezuela, now is the highest-salaried athlete in the world. There’s also the whim-of-a-billionaire angle: It appears Mike Ilitch, the Tigers’ 84-year-old owner, couldn’t bear the thought of seeing Cabrera wear another team’s jersey. So Ilitch pledged a piece of his fortune – two years sooner than he needed to – in one of the more capricious acts of capitalism we’ve seen in a long, long time. Cabrera probably can’t match Jeter in celebrity status and endorsement income. He plays in Detroit, not New York. He has one World Series ring, compared to Jeter’s five. And although Cabrera has won consecutive American League Most Valuable Player awards, he doesn’t particularly enjoy being interviewed and has shown little interest in becoming a marketing superstar. Yet, Cabrera’s new contract represents something profound on the American sports landscape: It shows Major League Baseball remains a thriving enterprise, with good competitive balance despite the obvious advantages of wealthy clubs such as the Yankees and Dodgers. Think about it: Detroit is going through the largest municipal bankruptcy in American history. And that city’s baseball team – which relies heavily on local revenue – just signed its franchise player to the richest guaranteed contract known to the sports world. Business must be good, right? Baseball’s critics say the game isn’t exciting enough, and the sport absorbs a disproportionate amount of criticism (relative to other leagues) for performance-enhancing drugs. But despite the unflattering comparisons to football’s ubiquitous popularity, our national pastime is quite healthy. A $292 million commitment — when adding Cabrera’s existing and new contracts — wouldn’t be possible otherwise. MLB and the MLB Players Association would be wise to remember this day, during what could be a contentious round of collective bargaining when the current basic agreement expires after the 2016 season. Yes, the current system has flaws. Draft-pick compensation on free agents has hindered the open market, and spending limits on amateur talent have frustrated the earnest rebuilding efforts of some clubs, such as the Chicago Cubs. But if a Detroit-based team can hand out a record-setting contract — without a salary cap to give it similar spending ability to a competitor in New York or L.A. — then those in the corridors of power should realize an overhaul (read: work stoppage) isn’t necessary. You can argue that Ilitch is an outlier among owners. He’s so obsessed with winning a World Series, and so successful in his other business, that he seems downright uninterested in trying to turn a profit on his baseball team. He showed restraint recently in failing to meet Max Scherzer’s asking price during extension talks. But apparently he has a soft spot for Cabrera. Was this an efficient use of the Tigers’ payroll? No. Are the Tigers likely to earn a strong, dollar-for-dollar return when Cabrera earns $31 million as a 40-year-old designated hitter? Absolutely not. But the Tigers are proving that even mid-market teams can keep their superstars over the long term . . . and the really long term. It’s difficult to say that is a bad development for the sport, even if rival executives grumble that the cost of doing business just went up for them, too. Because as much as the numbers shock us, Cabrera’s contract isn’t all that different in scale from the 10-year, $225 million extension Joey Votto signed with the Cincinnati Reds on the eve of the 2012 season. In relative terms, that might have been an even bigger financial risk, as the Reds play in one of the smallest television markets in the sport. If precedent has taught us anything, it’s that Cabrera won’t hold the record for very long. Mike Trout could sign one multiyear extension soon, then top Cabrera’s benchmark contract later in his career. If and when that happens, critics will scold the offending team for its recklessness. But no one should ask where all the money is coming from. In a $9 billion industry, spending power is self-evident. Yes, Miguel Cabrera is the new face of baseball . . . right up there with Ben Franklin.